The latest release of Solibri Model Checker (SMC) v9.8 adds the ability to create categories in the Model Tree view to organize your models and drawings. In SMC v9.8, you have the option to add categories and set your models and drawings to those categories as you load your files. Below, the short names and disciplines have already been set. To set a category for a model, select the model(s) in the “Ensure Model Disciplines and Categories” dialog and click the Add Category button. Below, we’ve added categories for the 3 disciplines of the files. You can also set the category of models by right-clicking them in the Model Tree view and selecting Model Categories. Below we’ve selected the three architectural 2D PDF drawings and clicked the “Choose…” option. Models can be set to multiple categories. Below, the “Drawings” category has been added. Below, the selected 2D PDF drawings are set to both Architectural and Drawings. The 2D PDF drawings are then neatly organized under the Architectural and Drawings category folders. You are able to select category folders and then set them to the selection basket, thereby isolating those categories in the 3D view. Below, the structural 3D model, the floor plan and a section drawing have been isolated in the view. Importantly, you are able to filter components in the component filter parameter tables by their Model Categories property found under the Identity property group. Below, the rule parameters are set to check for intersections between the MEP and Structural model categories. 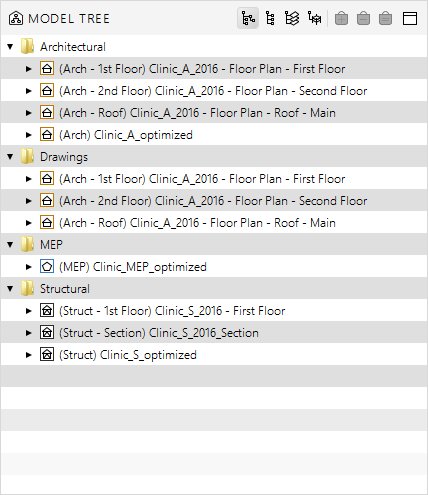 After running this rule check, in the Results view, you can see structural beams and columns that intersect components from the MEP model. Since you are able to name categories anything you want, this provides an additional level of categorization over the built-in disciplines assignment of models. You can, for example, use categories to define MEP systems, or segregate Architectural project elements such as Core and Shell. This is similar to what was previously able to be accomplished and discussed in the article: Creating Your Own Disciplines Through Classification. Additionally, the categories are collapsible folders in the Model Tree, providing better organization and understanding of a project’s structure.